Think of this as your “childbirth manual,” a step-by-step guide to prepare you for what lies ahead. We’ve divided the process into stages to describe the typical changes that occur as labor progresses. The first stage encompasses the very beginning of labor, when contractions begin, all the way through active labor, when your cervix is almost fully dilated. The second stage covers transition, when your body shifts from dilating to pushing, and the movement of your baby through the birth canal and into the world. Finally, there’s the third stage, when all of your hard work is done and your body begins to recover. You will most likely move from one stage to another fairly seamlessly. Although every labor and childbirth is unique—yours will unfold in its own way—the process is remarkably constant. The cervix begins to soften, thin and move forward, and it may begin to open. The baby settles into the pelvis. At this point of childbirth, contractions may be noticeable as an achy sensation or as pressure in the lower abdomen or back. Contractions in this phase are usually irregular—starting and stopping; sometimes strong, sometimes mild. This is your body’s natural way of gearing up. This phase can last from a few hours to a few days. Try not to worry whether or not this is really labor. For the vast majority, labor eventually makes itself very clear. Take good care of yourself. Eat, drink plenty of fluids, and rest or take a walk. Surround yourself with people that help you feel comfortable and safe. Your support team can keep you company and provide reassurance. Try to be patient and have confidence that your body is doing exactly what it needs to do. The cervix continues to thin out and open, dilating up to 6 centimeters. Labor is meant to be gradual, so this phase may take quite a while—usually about two-thirds of the total labor time. Over a period of several hours, contractions will become longer, stronger and more regular (about 5 minutes apart, each one lasting 25 to 45 seconds). A pinkish vaginal discharge (called “show”) usually increases as labor progresses. It can be hard to believe that this is it. Take time to settle down and work with the labor. The best thing to do is to take care of yourself. Alternate rest and activity (for instance, take a nice walk followed by a relaxing shower), eat easily digested foods and drink plenty of fluids. Do simple things like shave your legs, wash your hair and get into comfortable clothes. If it’s nighttime, try to rest. Many parents find that the best place to be during this phase of childbirth is at home, where you are comfortable and have privacy. When contractions become so strong that you can no longer talk yourself through them, try using relaxation and breathing strategies. Your support person or team should be nearby, helping you to stay calm and confident. Keep the environment pleasant—perhaps listen to music, ask your partner for a massage or prepare the baby’s room. 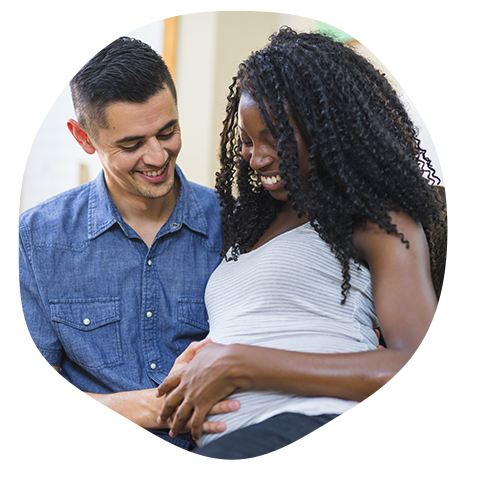 Most expecting parents head to their birthing facility when they progress from early labor to active labor. You may want help to decide when to go to the birthing center. Traditionally the 5-1-1 rule is used`; that is, when contractions come every 5 minutes, each lasting a full minute, and have been that way for an hour. More recent recommendations are 4-1-1 (four minutes apart) or even 3-1-1 (three minutes apart). However, listen to your body and trust your instincts. If you feel it is time to go to your birthing center, follow that instinct. Contractions continue to become longer and stronger, until they’re eventually about 3 minutes apart and last for about a minute or more. During this phase, which generally takes from 2 to 6 hours, the cervix effaces and dilates to about 8 centimeters. In active labor you usually get very focused as the hard work begins. Now labor has real momentum. Listen to your body and develop a rhythm with it. Do something active during the contractions, such as breathing in a pattern or moving around, and rest between contractions. As the strength of the contractions increases, so does your need for support. All present should focus their attention on you. Changing positions frequently not only helps you stay more comfortable, but also enhances progress. The environment can influence your labor. Make it peaceful and personalize it with music and dim lights. The cervix finishes dilating and effacing. Contractions are now powerful and efficient, so this phase is usually quite short (less than an hour). You may feel nauseous, shaky, restless or irritable during this phase of childbirth. To keep from feeling overwhelmed, focus on one contraction at a time. Continue with breathing, vocalization (if it helps) and rhythmic movement. Even though rest periods are short, they allow you to relax deeply and restore yourself. Those providing labor support should offer close, undivided attention, unwavering encouragement and praise. If you’re using a breathing pattern, your team should try “conducting” to help you focus or moving with you in rhythm to your breathing. Your body shifts from dilating to pushing. The baby makes his way down through the pelvis and birth canal. This phase can last from 15 minutes to several hours. Although it may take several contractions after full dilation to be noticeable, you will most likely get an urge to bear down. Your body is giving you clear instructions on what to do. The urge to push usually gets stronger as the baby descends. Many at this stage feel more clearheaded and have a renewed sense of optimism when pushing begins. Just before the baby is born, you may feel a burning, stinging, stretching sensation at the vaginal opening: A sure sign that you’re almost there! As the baby’s head emerges, it turns to one side to allow the shoulders to align and then the rest of his body slips outs. The urge to push usually feels strongest at the peak of the contractions and then fades toward the end. Just follow along and do what feels right. For most during this phase, this means taking normal breaths as the contractions build and then pushing when it becomes irresistible. It may help to make sounds (much like athletes do) in response to what you’re feeling. Labor supporters should provide quiet, reassuring encouragement. If progress is slow, you can change positions. Squatting, all-fours and side-lying are all good options. Let go of any tension in your perineum (vaginal area). Applying warm compresses there may help you push. Try to rest deeply between contractions. Your baby can be placed on your abdomen so you can be skin-to-skin immediately after birth. There should be a delay of at least one minute (preferably 1-3 minutes) before the umbilical cord is cut to allow the blood carrying iron-rich hemoglobin in your placenta to transfer to your baby. What a mix of feelings—excitement, joy, awe, accomplishment and relief! The placenta is delivered, usually within the first 10 minutes. Your health care provider will make sure you are comfortable. Cold compresses are often applied to the perineum to ease discomfort and reduce swelling. You may experience after-pains or “the shakes” after childbirth. Touch, caress and cuddle your baby without time constraints. Keep baby skin-to-skin with you from the moment of birth. This is a good time for your first breastfeeding, which tightens the uterus and decreases bleeding. All routine infant procedures can be done without removing the baby from your side. Request that measuring, weighing and applying eye medication be delayed for a few hours.